I think it's every teacher's and parent's hope that you foster the love of reading in your classroom and home. Whether it's in the classroom, curled up in bed, or even on a long car ride, our hope is that all children are given the opportunity to fall in love with reading. When the seed is planted at a young age, children's literacy skills and imagination soar. Of course we got to thinking that we would like to share our love of reading to not only our children, but to your children too. We'll just have to have a book club! Each Wednesday we will feature a children's book that we find worthy of sharing with you through the Lil Sprouts Book Club. We found it only fitting to throw in some creativity too by sharing a hands on activity that will extend the story. Since we're already on the topic of planting a seed in children, we found the perfect book for you. 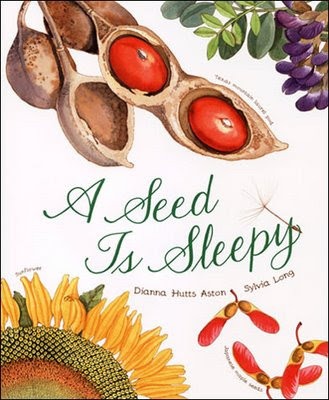 A Seed is Sleepy by Dianna Hutts Aston and Sylvia Long is a gorgeous tale of wandering seeds. Through illustrations that marry art and science so beautifully, children will see a wonderful variety of seeds and their benefit to our world. Have you ever thought of a seed as being sleepy, or naked, or generous? This informative and creative story will have our Lil Sprouts asking inquisitive questions such as these. After reading the story extend their knowledge of seeds by pulling some seeds out of the pantry. Have children examine them. Encourage children to sort them by color, size, and texture. Lima beans work great, you can soak them over night and have your little ones open them up the next day, it's easy to identify the seed coat, root and small leaves. Take it a step further and plant the seed in a cup or plastic baggie and allow children to observe it over the coming days. Tap into your child's inner artist, get creative and make a sunflower using a little paint and your child's hands. The learning opportunities are endless when you let your child's imagination take hold. Encourage beginning reading skills by pointing to words as you read, have your child look for clues in the artwork, and most importantly asking your child questions about the story being read. We hope you curl up with your little ones tonight and grab an old favorite or a new book off the shelf and let your little ones imagination take flight. Join us every Wednesday for a new book and some creative ideas to extend the story beyond just what is written on the page.